Do you know of any stock in India which has not moved in last 10 yrs ? Hindustan Unilever is one of them ! . Successful investors like Warren Buffett always advocate the importance of investing in stocks for the long term and not just getting in and out of the stock. But more than investing and holding for a stock for the long term, it is important to zero down on the right stock. Or you might even hold a stock for more than ten years and still make very low returns. Let us take the example of Hindustan Unilever Ltd (HUL), a company which used to be the largest company as per market capitalization in India, at a certain point of time. But in the last 10 years the price of the HUL stock hasn’t gone anywhere. The stock price touched an all time high of Rs 314.123(adjusted for bonus) on February 25, 2000. This price was never beaten until September 24, 2010, when the stock closed at Rs 314.65. On November 9,2010, the stock closed at an all time high of Rs 318.9. 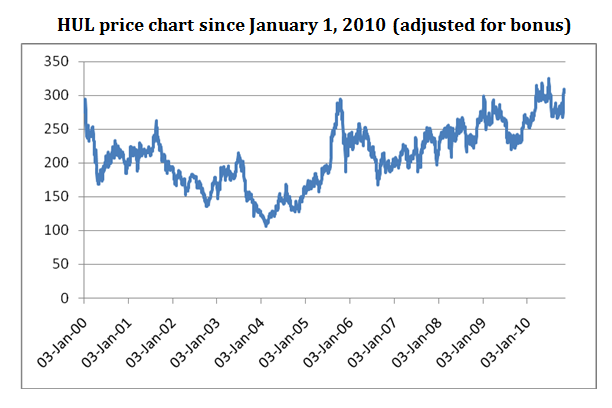 This price was again overtaken in early January (January 5,2011) when the stock closed at an all time high of Rs 325.65. Currently the stock is moving in the range of Rs 300-310. So the point is that if you were a long term investor in HUL and had invested in the stock in Feb 2000, and held on diligently for 11 odd years, you would still not have made any money on the stock. What HUL tells us is that the buy and hold strategy may not always work. Raj Krishna, an economist, coined the expression “hindu” rate of growth, to express the slow rate of growth in socialist India, when India used to grow by around 3% every year. Krishna was not a great fan of the socialistic model of development being followed in Nehruvian India. He was a believer in free markets. So looking at this secular trend, year on year, and wanting to take a dig at Nehruvian socialism, which he felt was not working, he came up with an antonym for the word secular (Nehru’s other pet peeve), and so called this growth, the “hindu” rate of growth. HUL has signified this “hindu-rate” of growth over the last decade. Let us look at some numbers here. The annual sales growth of HUL over the last decade sales have risen at the rate of 6.2% every year to Rs 19,987.1 crore. Profits have grown even slower at the rate of 5.8% every year to Rs 2306.6 crore. The does not inspire confidence among investors, given that the rate of inflation during that period was at similar levels. So in real terms there has been very little or even no growth in profits and sales. Hence the stock price has been flat. Soaps and detergents has been the main stay of the company over the years, and still contributes nearly 75% of the revenues. The company has very little pricing power in this category, given the increased competition that it has been facing. With a slowdown hitting United States, P&G has become aggressive in India. Media reports suggest that P&G is looking to launch its toothpaste brand Crest in India. That should heat up things for Close Up, HUL’s premier toothpaste brand. The cash rich ITC is gradually building businesses similar to that of HUL. Over and above that there are newer players like Ghadi detergent and older players like Nirma in the lower segment of the market, which have been giving HUL a huge run for its money. To counter this competition HUL has had to constantly resort to price cuts to keep the revenues going in this segment. This is likely to continue in the days to come leading to a very limited pricing power in its premier business. At the same time it needs to keep its advertising expenses high in order to generate a high brand awareness of its products and hope of increasing sales. During its glory days, HUL’s strategy was to constantly jack up margins. The management graduates who run the company probably forgot a basic lesson in economics. When a company makes ‘abnormal profits’, new competitors enter the arena and drive away margins. The margins also came from deteriorating the quality of their products. What did not help was the power brand strategy the company decided to follow 10 years back, where in the focus was on 30 odd ‘Power Brands’. The ‘power brand’ strategy prompted HUL to withdraw from a large number of small markets. This has given an opportunity to many small players in the market. Some of these brands like Ghadi detergent are now seriously challenging HUL. To its credit the company has tried to get into new businesses like selling water filters (Pureit). But these businesses will still take sometime to grow. Also the competition in this market has started to heat up with Tatas announcing their entry with Swach. HUL recently declared its results for the quarter ending March 31, 2011. While it managed to increase sales by around 14% to Rs 5,022.6 crore. But even with this increase in sales the net profit went down by 2.1% to Rs 569.2 crore. Analysts covering the company came out with reports saying that the results beat their expectations, which is basically a polite way of saying that results were not as bad as we expected them to be. Given these reasons, those investors who are still invested in HUL, its time they sold out. This stocks is an excellent example of what John Maynard Keynes, the famous economist, said a long time back, “in the long run we are all dead”. I was using “Moneyworks4me” site (10 year x ray)to know whether a particular stock is fundamentally good or not? Could you share your view on this site http://www.Moneyworks4me.com. Is it worth taking subscription? Raj Krishna did a disfavour by calling low growth as Hindu rate of growth. I suspect that he must be one of those marxist economists of India who hated the word Hindu. Given the size of Hindustan Unilever, I cannot see it growing at a fast clip – in mature businesses like detergents and soaps. I too agree with you Raghvendraji. I think you deserve an applaud for the kind of analysis you do. Whatever you put across are your thoughts and opinion which one may agree or disagree but its worth the effort. Also – HUL face value is now 1 and no further splits. Wonder if it makes any difference anyway though. I think the article misses some important points. Firstly it took 10 year period just to suit the argument that stock price did not move. Did it take different 10year periods to see how it fared? Also even if we take the 10yr period, there are two aspects to it. HUL as a stock and HUL as a business. While the argument for HUL as not being a good stock is ok..it is flawed at the same time. Investors should not have bought HUL in 2000 in first place. Given the price and the earnings it was generating at that times, its a PE of more than 60 times. So the first mistake is buying it at such high price and thinking that price will only go up (greater fools theory). What would be the returns if someone bought HUL at its lowest price of 108 in 18 Aug 2004. The returns would be phenomenal (multi bagger) if you include the dividends paid. So the profit potential of a stock is based on your buy price. If one was foolish to buy it at any price and believe in EMT (effiicient markets) they god save them. Now lets take a look at HUL as a business. In these past 10 years from 2000 to 2010, it just took around 300 crores from all the profits it generated in all these 10 years (lowest operating profit being 1540 in year and highest is 2700+ cr). While it just added 330 cr to the fixed asset and wc combined, its operating profit has grown from 1500 odd crores to 2700 odd crores. In which business do you get more profit than the capital that you employ back. Is it not a wonderful business that you would luv to run? I agree that HUL is now a big elephant which can only move slowly. So, would be google, apple, microsoft or berkshire hathway when they grow too big. Its better to return money back to shareholders than to destroy that value by investing in stupid growth which does not make sense. HUL does that. Disclaimer: I am neither invested nor would invest in HUL unless I find it is available at attractive valuation. 2) There are articles which are ill researched, let it be your online term insurance or this kind of obnoxious stuff. This is not the way to calculate returns. Manish, please stop posting these kinds of ill researched articles to avoid losing your well built reputation. And one sincere request if possible add a disclaimer or still better remove this article so as to avoid disbursing wrong information to the general public. I hope you take this comment in a right way, this is not personal criticism but after all, we are learning together and want to provide right information to the general public. Your blog is far way better than blogs such as subramoney which is nothing but arrogance filled with loads of advertisements. HUL came to this stage because they took their position forgranted. There was a time when their brands were all around, too many of them and too little management. They didn’t concentrate of consolidating themselves, just kept on spinning out items and then too much of profit margin gave others the space. From both sides it was a problem of plenty. about raj krishna being a free market lover – huugggeeely incorrect.he was a statist -out and out.his dig was more aimed at hindus than the nehruvian fabian thinking. Raj Krishna was professor of Monetary economics in delhi school of economics(hotbed of socialist thinking) and he wrote a memorandum titled “the second five year plan,investment magnitudes and their implications’.his proposals included extension of state trading in commodities,(food,oil,cloth),nationalizationaand physical controls,and be ready to be shocked – maintenance of a “labour armies” -shovel ready monkeys ready to do whateve the sarkar wanted them to do. Raj krishna was a student of pino communist – Harold Laki at London school of econ.what dya expect. i really hope you correct your post about him being a believer in free markets.it makes the blood of free market lovers like me boil. The same HUL chart from 2004 onwards shows a 200% gain. During the bear market in 2008, the stock was rising while almost everything else was falling. Even during the current corrective phase in the Sensex, HUL is outperforming. The article shows that the author is obviously not an investor. Why would an investor buy a stock near its all-time high? Zeroing down on the right stock is not enough. It has to be bought at a fair price. Clever headlines are no substitute for ignorance. Really disappointed with this poorly thought article. FMCG stock in a maturity stake will obviously not be able to give Capital appreciation. However, what when can expect is “capital protection” and regular (almost sure) dividend from them. I have worked on several model portfolios where FMCG companies like HUL are an important component to generate income stream through revenues. Manish, We have high expectations from your portal and your articles are always great. This is an aberration. You blog disappointed me for the first time today. Stock analysis was the last ting I expected on this portal. I’m sure this is not you. For that matter, sensex was 4500 at the peak of 1992 bull market whereas it was 3000 sometime in early 2003. That means losing 33% in 11 years on sensex. Similarly, same sensex was 100 in 1979 and reached 4500 in 1992. That means 45 times in 13 years, great job indeed!! So, in statistics, all depend on starting point and ending point you consider for purpose. Numbers can be twisted as you like. Someone rightly said “Lies, Damn lies and statistics”. Who knows the fate of HUL, 11 years down the line? I have a different view for the reason the slow down of sale of HUL. The reason is the supporters of Baba Ramdev.. which are in crores now in India has boycotted all the zero technology goods made by foreign companies..be it HUL..ITC..P&G etc. Please watch this lecture of one of the great thinker of our country Shri Rajiv dixit. http://www.youtube.com/watch?v=GBvbBBUhZ1Y If you also believe what he is saying is good for our country do support Bharat Swabhiman Andolan..and Boyocott all the zero technology goods made by foreign companies. Baba Ramdev came into the picture much later. It was intense competition, over crowding , price wars with P&G, ITC, regional brands etc which impacted profits. The Management of HUL seem to be not fond of markets. The very positives of this company are, it is in the business in India for the last 40 years with few allegations or compliance breaches. I have interacted with many employees of HUL and most of them sees the company as employee friendly. Less attrition and able to hold experienced people to its hold is a big advantage. Last 10 years data without dividend is skewed for HUL given for its 40 year history. It is even more aberration to compare it with just on-board companies like ITC and Dabur. The track record of most of the FMCG companies would be good in the beginning years and they enter slowly into stabilization mode. If we take the RoR from the inception of HUL, it would be different reality as like Gold. Having given the due credit to its achivement, am surprised that it is big recruiter of talent from top notch schools but it is lagging incredibly into new products launch. Looks like they are following the model of software drinks business of heavy ads spending and revamping the distibution networks frequently thanks to the business grads penetration into the company. Given it’s vast inroads into Indian households already, the penetration could have used for its advantage. Certainly Innovation is lacking and it is the time for it explore new dimensions. Hardly few investors in India opt for FDs. I cant recall but i read an article way back in newspaper. It was the branding which is taking a beat for HUL.Like Say if we say a company name hero honda or say sony they are the leaders in atleast one segment and doesnt do too many experiments in going in each and every segment. That is not the case with HUL.What they thinking is they want to be leaders in 99 segment if they have 99 product.So if one product does well and other doesnt they eat each others profit and company remains nowhere. They should focus on one product and let it be their milking cow.Plus FMCG sector is the one which eats your maximum profit into Ads.So again not helping. If you compare with its peers i feel ITC knows better how to work out and they themselves know all in its life they cant expect tobacco to be their milking cow.Thats the reason from 90%+ profit making revenue for the company in 20 years they have diversified that now tobacco counts upto 50% which again they trying to reduce.In short they keep their milking cow grow plus also focused very well on other brands under them and didn’t allow other product to eat their profit if they making lost. I am sorry to say, you have no understanding of stock markets. I agree , I seek some enlightment in stock markets area from experts . Share your thoughts and help us understand things in better way . What about the dividends they paid..? I hope you are aware of that stock returns doesn’t mean only in terms of price. And it also depends the price we pay for value of the stock & the time of purchase. Why to only consider from 2000-2010, why not from 2004-today. PS: I just commented in terms of price & returns not its growth story. If you want to factor in the dividents , its a different story , We are focusing on the price movement here , whatever analysis is done in stocks is directly related to prices , wheather its fundamental or technicals . Did you test the SIP data or you are just guessing ? 2. Overlooking the distributer is another fallacy. HUL gives least margin to retailer among all FMCG co. Where HUL spent heavily on TV ads, smaller cos. paid incentives to distributers for growing sales as well as leaving good margins for retailer who in turn loved to push their product. By spending less they captured big market. 3. Due to the lower margins organized retailers also dont prefer HUL. Its my personal exp. that HUL products are kept in far away shelves in Big Bazaar and More stores whereas other brands are pushed heavily. 4. Overlapping Portfolio – It has multi brands in same category like two shampoos, many soaps, creams, etc. these eat into each others market and the co. has to spend too much on ads to keep awareness of too many brands. HUL must reduce some flabs and turn into a leaner and focussed company to come out a winner. Hindustan Unilevel Limited is in the Maturity Stage of its Business. As it is in its maturity stage, it does not need much funds for Reinvestment and therefore it distributes its earnings to shareholders as dividends. It has a good track record of paying both Interim as well as Final Dividend. Businesses in the maturity stage do not have high Risk and Return factor playing and are therefore considered a safe bet. Hindustan Unilevel Limited is a high Dividend Paying Stock. It not only pays Final Divident but also pays Interim Dividend. It is in the maturity stage of business and therefore it does not need much funds for Reinvestment so it distributes it as Dividend amongst its shareholders. And as it is in its maturity stage, the Risk and Return is low and this stock is considered a very safe bet. So over a long term , which type of investor should buy it ? Is it for an aggresive investor ?